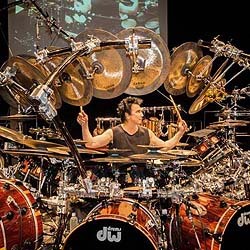 In other news, over the last four decades drummer Terry Bozzio has built an extraordinary legacy based on his unique approach to rhythm and the diverse and acclaimed recordings to which he's contributed. On April 18th, 2014 he went beyond those genres into new mediums with the release of an art collection titled [RHYTHM] + [SKETCH]. 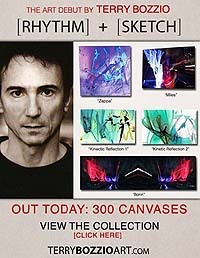 Available exclusive at www.terrybozzioart.com, the collection is a fusion of artwork crafted over the last three decades mixed with new abstract visuals made from capturing rhythm. Chatting recently with the man himself Terry Bozzio, and knowing he was celebrating the 50th anniversary of his first drum lesson by going on this 3-month North American Tour, I first asked him to tell me more about this very first drum lesson he'd had back in 1964. "Double and single stroke roll, 5 stroke roll, basic beats. And reading rhythms! I was into it! Todd Fleicher was an educated percussionist and started me off on the right foot. I was lucky to have him as my first teacher." Had you always felt the passion to be a drummer since you were a child, or was there another musical instrument you thought you might like to master? "No, it was always drums. I took 6 weeks of guitar, but didn't like it because it hurt my fingers. (Still does)!" 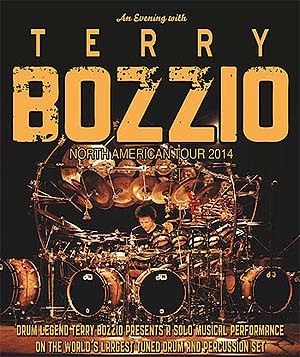 These upcoming "An Evening with Terry Bozzio" tour dates will hit over 40 cities from San Diego to Jacksonville to Montreal to Vancouver to Los Angeles and (seemingly) everywhere in between! As you are no spring chick any more, how will you prepare yourself fitness wise to endure such a 3-month skin-bashin' road trip? "I have learned to plan & pace myself so that it's comfortable to travel. And playing the drums the way I play is not skin bashin' all night long!" Is there ever a point on such a long road trip, given that they are nights of solid solo drumming where your arms are just lead and moving on auto pilot, perhaps? "No, that has never happened to me. Once again pacing and playing musically." You will be performing using the World's Largest Drum and Percussion Set on this tour so that begs the question: Where did you find this set or did you have it made? "I've built maybe more than a dozen big kits with my sponsors DW and Sabian. I have 3 big kits right now. One in Japan one in Europe and one in the US. I've been developing my concepts over 25 years in pursuit of making music on the drums." You've stated that these your nights are not a clinic or a workshop - so, what are they? "A solo performance that will take you on a time travelers journey through rhythm melody harmony and different influences like classical music, ambient film score music, improvisation and ethnic percussion from all over the world in a theater like setting decorated with my artwork." Indeed, you recently released an art collection entitled [RHYTHM] + [SKETCH] so please do tell us more about that "The concept uses long exposure camera settings filming me as I play with various types of light emitting drum sticks. The sticks make fluid patterns. The. The photos are electronically enhanced and tweaked in a computer. And finally combined with abstract paintings or sketches I have done over the last 30 years." It has also been made known that there are 12 different works featured within this new collection, with a limited number of each piece - numbered and signed - being sold to the public. What made you want to do this for your fans and what prices do they start at? "I don't know about the price, but the SceneFour art team contacted me about it through a friend (drummer Stephen Perkins) who had also done a similar project w/ them." You once said, "I just want to make music on the drums," so having seemingly done that now for many years, when drumming is done for you (for whatever reason) what will be the next evolution of Terry Bozzio? "Why would I ever stop drumming? If I could not play drums I'd still compose write and do artwork. If I could't do the latter I'd probably be very near to death!" I mentioned above that your upcoming "An Evening with Terry Bozzio" tour dates will hit over 40 cities, but sadly not us here in Detroit, MI! Why leave us out the drumming extravaganza loop, my friend? "My booking agent just gets gigs where people want me. I love Detroit and have played there many times. I guess he just could't find an interested promoter or venues this time." Finally, we here at Exclusive Magazine love Penguins so we were wondering if you did also or if you had any funny stories about them? "No, but I have seen the movies about penguins and have a healthy respect and regard for them!" If you would like to win an AUTOGRAPHED DRUM HEAD from Terry Bozzio, just answer this question about the great man himself: In 1968 Bozzio attended Sir Francis Drake High School in San Anselmo, California, where he received a music scholarship award, and later went on to the College of Marin. During this time he played Bartok-Dahl-Cowell & Baroque chamber ensembles with which two-named Symphonies?! Terry Bozzio Doing His Thing @ Gear Fest 2013!